Agavaen wakes up one morning after a night of drunken carousing and larceny, to find her compatriots have stolen all the loot and she is blamed for the loss. It doesn’t help matters that her magical amulet was stolen as well, the last link she had to her mysterious homeland. She knows she isn’t human, and humans fear and despise her, except for the scoundrels who obviously couldn’t be trusted either. So what is the poor gal to do? Naturally she sets off to find the thieving thieves, and along the way she will encounter many a roadblock, and maybe find something out about human motivations and morals along the way. How she chooses to deal with her misfortune, and how she chooses to interact with her human contacts leads her down one of two paths to her final journey home. There has been a trend for some time now in Role Playing Games (RPGs) to make them hack and slash fests. Some new to the genre think this is what an RPG is all about, having entered the RPG scene long after the vision of Dungeons and Dragons was in vogue. Not that there is anything wrong with enjoying a hack and slash game of course. But a slower more thoughtful game, including turn-based combat and more adventurous quests is every bit as much an RPG – it’s just a different sort. Neverend is a throwback to former times, utilizing turn-based combat and offering a large number of quests, some necessary for the main story line and others optional as a way to level up in experience or for monetary gain. For the same reason that I would be a failure as a bank robber, I feel compelled to confess that when I began the game I was underwhelmed. The graphics aren’t state of the art, having none of the in your face glitz that is Oblivion or Dungeon Siege II, and the combat requires deliberation, choosing a weapon and battle tactics turn by turn in an “arena” sort of setting. It reminded me a great deal of games such as Return to Krondor or even The Fifth Disciple. However, the more I played of the game, the more I came to appreciate the strong story line and the imaginative quests. I enjoyed this game as a fantastical romp in a medieval setting. Where the graphics show the love and care of the artists is in the various creatures our anti-hero battles. They are different from the usual fare of orcs, and both their appearance and their animations are a joy. There is none of the woodenness that many characters have in games (where the attacks are largely the same), for the characters make their attacks differently and some quite stylishly. Some of the locations are attractive, with intensely colored detailed fauna. And some of the spell effects are really quite well done. Changes in Agavaen’s attire are noted in the close-up screen, a nice touch. The end cinematic is gorgeous, and I only wish more games had an ending as definitive as this one. If you’re looking for Morrowind graphics, however, you won’t find it here. As I mentioned previously, there is an old fashioned look to the game despite its being in 3D, and depending on one’s preferences this can be of more or lesser import. One unfortunate quality is that when our main character enlists the assistance of another character, this is not depicted on the screen until battle ensues. What is shown instead is a facial portrait in a corner of the screen. There are curious changes from time to time with the camera angle. Some views are top-down, some are three quarter view (and sometimes the camera sweeps during combat and your view is blocked by a tree). On occasion, it is difficult to point to one combatant until the camera angle changes. In one dungeon sequence, you are twisted and turned around so much that it is difficult to figure out the layout. Not knowing if you are coming or going is a phrase that comes to mind for this, and for many other scene changes. 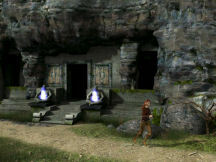 You enter a doorway going one direction, the next scene has you moving in the opposite direction, and you have to change your direction very quickly to avoid going through that same door several times if your finger is on the arrow key (which is how you move the character in this game). The main musical score is orchestral, reminiscent of medieval times, and quite pleasing. As you wander about the countryside, the strains of the flute sound particularly appropriate, as if carried on the wind from some remote town. Upon engaging in battle, there is more of an up-tempo (and less pleasing) soundtrack. The ambient sound is limited in scope. The voiceovers range from the relatively pleasant voice of the main character -- to the adequate -- to the totally abysmal. If there had been a way to kill the townspeople to put them out of their misery, I think I would have done it. Fortunately there are subtitles. This is a single player game, no multiplayer option. The game hung twice on me while installing the one-CD disk. The default movement keys are the arrow keys on your keyboard, and either keyboard or mouse can be used during battle. You have the ability to remap the keys, and to opt to turn off dynamic shadows along with the usual volume controls. There is also an option to have tutorial hints on or off. As the same hints keep coming up every time you are in battle, this is an option you may want to uncheck. The game is not alt/tab friendly. You can play it without the disk in the drive. You can use your Esc key to avoid watching a cut scene, and you can click through dialog to speed along the game if you wish. There is no fog of war, and you simply scroll through the screens. A welcome addition to the North American release of this game is a map which you can view by pressing “M” on your keyboard. Because there are so many trees and such that you have to go around, the map was most useful when trying to find necessary locations that weren’t in town. 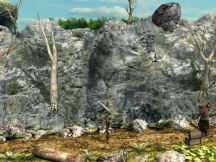 The map would show a “break” in the tree line, which would indicate where you could go to find what you were looking for – without a map this would be an exercise in frustration, as the view of the game is limited to your immediate surroundings. However, there are a few items that are into the tree line, and it is hit or miss as far as locating them is concerned. Load times for new locations are short. Between your objectives (towns or particular locations for furthering the game) you will encounter a huge number of battles, some random and some fixed. It is possible to run into foes much stronger than you fairly early in the game, and it is useful that there is a “Run away” option for a battle tactic. Unfortunately, since your agility statistics are low, the baddies may be able to strike you down before you have the option to run. Luckily you can save at any point in the game, and the number of saves is virtually unlimited. Being successful in battle depends a great deal on your character statistics. As you begin a battle, each participant will have a sliding scale which takes into account their statistics, such as agility, strength, endurance, and point level. Depending on which weapon you use and which attack technique you select, these statistics are added to the previous ones, indicating who makes the first strike, and so on. For instance, if you wield a long sword, you will have several choices of which technique to use -- such as a basic hit, which will enable you to quickly attack, or an attack which takes much more preparation time but does much greater damage. I found upping my agility points the most useful attribute I could have in the game. I could often slash three lesser pointed baddies before they could lay a hand on me. There are also tactics where you can make the enemy bleed, and they will lose hit points as the battle progresses. Strategy is necessary to have a successful outcome for some of these battles, and I found this a refreshing change from the frenetic clicking on screen that is common in many a hack and slash game. The system for using magic I found unnecessarily frustrating. I usually prefer to use magic in an RPG, but not in this game. To use magic you have to have the recipe for a spell, and then you have to collect the runes necessary to make the spell, and then click on them in the correct order. For one thing, as you begin the game you don’t have many runes available to you, and what is available is puny in battle. For another, the runes are small and the colors are similar, so if you click on the incorrect runes to make a spell, they vanish from your inventory. Even if you correctly assemble the spell and then use it, it is then gone, and you’re back to collecting runes again. I really think the developers should have stuck to the tried and true mana approach to magic and not attempted these innovations. The spell graphics are very nice, but the system makes it tedious to use them. I played the first time through the entire game without needing them, for it is only the ghosts that are impervious to any other weapon and there are ways to avoid the ghosts for the entire game. You can’t use magic outside of the battles either. Due to my not using magic, I didn’t need to put points into the intelligence statistic, and was free to overload the agility statistic. Hey, I may have been the dumbest character, but I was fast and strong, and I did finish the game, which is more than I can say for those spell casters I came across! The quests are many and varied, and quite interesting for the most part. I think this is one of the higher points for this game, as some of the quests are particularly creative. One quest has you figuring out how to win out over an invisible demon that has made off with a chain necessary for a castle to operate its machinery. Another quest involves you in a love triangle, and another one in the politics of the town. There is often more than one way to get the points for solving the quest. How you interact with people and how you solve some of the quests has an effect on your character, and you can be good or evil. Those attributes will ultimately decide which ending you get in the game, so it is obviously replayable. At certain points a visual effect appears on screen to indicate how your choices have affected your good or evil status. This is also a nice touch. 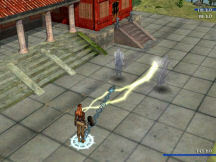 Inventory space is unlimited (a welcome factor in the game), with no limit placed on the number of items the character can haul around according to her strength statistic. I was happy to not have to feed or rest my character, as this is a tedious task to me when forced to do so in a game. You do have the ability to have her rest when she needs to regain strength, and you can carry a one-use tent with you, or obtain lodging in town. One of the biggest flaws I found with the game was that it is apt to crash. It crashed seven times for no fathomable reason, and I had to reboot. I was saving like a maniac anyway due to all the random battles one comes across while ambling through the countryside. But the crashes are still frustrating, especially after you have just won something particularly difficult. On one occasion, a necessary scene did not display my first two times through the section, making a quest item unobtainable. Despite its flaws, I enjoyed playing Neverend. The quests were creative and the story line was strong. The opponents were varied and different in appearance and abilities from any other game I’ve played. I will be looking forward to the next venture from the development team, Mayhem Studios. *With apologies to William Shakespeare.